IBASSIN: 2018 FLW Tour Kentucky Lake Day 2: Haynes 1st Lambert 2nd in Ledge Shootout! 2018 FLW Tour Kentucky Lake Day 2: Haynes 1st Lambert 2nd in Ledge Shootout! Haynes, Lambert way out in front of the field. With two more days to fish, it might be a hair early to declare the FLW Tour event presented by Costa Sunglasses a two-horse race. 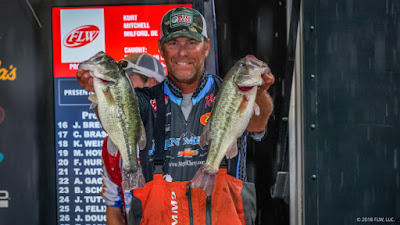 But then again, when Randy Haynes has the lead going into the weekend, Jason Lambert is only 2 pounds, 4 ounces behind him, and the next closest competitor is another 6 pounds back, you might as well start preparing for a ledge-master showdown. No one in the world is better at plying Tennessee River ledges than Haynes and Lambert. They’ve done more to prove it this week than ever, with impressive back-to-back limits in what has been a very challenging opening round of fishing. Today was the first day each reported experiencing those classic Kentucky Lake flurries that loads the boat quickly. But their weights did drop, and they really had to earn every bite. The Mississippi pro put a pair of 2 1/2-pounders in the livewell real early to start off the FLW coverage blog. Then he hit a lull. Eventually, Haynes spent about 45 minutes running some secondary areas. With nothing happening on those spots, he returned to his starting area – the same place he caught his weight on day one – and everything turned around. Haynes filled his limit at about 11:30 and upgraded a couple times after that. He says he caught eight keepers on the day using a Zoom Swimmer and a couple of other swimbaits. Part of the reason he changed from the deep-diving crankbait that he fished on day one to the swimbait on day two was to slow down his presentation and get more bites, but he also needed a break from cranking to rest an aching shoulder. Yesterday, he wound that crankbait hard and fast all day long. Haynes spent part of the afternoon playing defense on his spot, but he did work in a couple hours of looking for more fish that he could hopefully fall back on this weekend. There wasn’t much out there, so he says if his primary spot fails to produce tomorrow, he’ll make a big change. “If it doesn’t work out, I’ll just pull the plug and go to Paris,” says Haynes, who’s been fishing up at the north end of the lake. Lambert relied on one spot today, too, and not by choice. He says going out boat No. 132 meant he encountered a lot of other anglers on some of the spots he wanted to fish, including a school he located on day one that he’d hoped would contribute a significant portion of his catch today. He never made it onto that spot. The bigger issue, however, is that he’s finding fish but can’t seem to get them to bite. Lambert’s strategy has been to scan as many waypoints as he can. If he sees Asian carp on the spot, he doesn’t bother fishing it. He hasn’t had any luck getting bites from bass where carp are present. Unfortunately, due to pressure from his competitors and the carp, he had to run south to a shallow school and burn up his emergency reserves. The action there was fast and furious. Saturday will be a telling day for this tournament. Haynes seems to have found a potential winning spot. Lambert is scrambling. If he can get some sunshine, he thinks he can have better luck, but nothing’s for certain right now as the bass transition into their postspawn, offshore patterns, and the best ledge anglers in the world hope to stay on their trail.